The Bus Pirate from Dangerous Prototypes is a really useful tool. 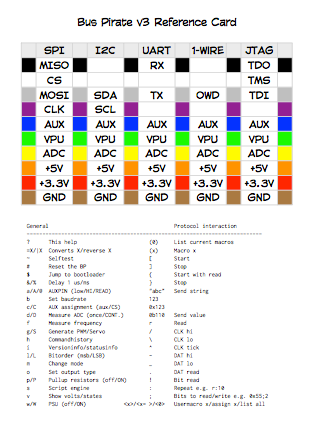 I use it regularly to bring up and test new I2C devices, or as a cheap protocol analyzer for I2C and SPI. Unfortunately, the supplied cables aren’t clearly labeled (only color-coded), and I found the reference cards available on the net lacking: they were usually not clearly readable and didn’t help much. So I created my own. See also ecronin’s case sticker, and the new pin reference card category. We’ll keep openly-licensed reference cards in the documents folder of the SVN, feel free to contribute yours. This entry was posted on Friday, November 15th, 2013 at 9:00 pm	and is filed under Bus Pirate, pin reference. You can follow any responses to this entry through the RSS 2.0 feed. You can skip to the end and leave a response. Pinging is currently not allowed. Nice, I’ll have to print one up. Credit card size format would be nice.